If you are an 80s kid, the you will certainly fall in love with this Microgaming slot machine. This video slot is themed round the 1980s era with all of its glitter and fame. This is why players will quickly notice the bright and the shiny colors of the slot machine once it loads. Apart from the visuals and the colors, players will enjoy the 80s themed interface and symbols that appear spinning on the video slot’s reels & lines. Speaking of which, this is an advanced 5-reeled video slot machine that has nine winning lines that players are invited to place their bets on. 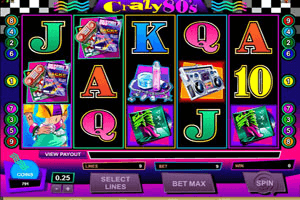 Play Crazy 80s Slot here. These bets include sun glasses, high boots, funky 80s outfit, 80s accessories among other colorful 80s themed symbols. Players will have to get at least 3 matching symbols on any of the paylines so they can earn a payout. Players can view the different payouts through the paytable of the game. It will also show them the special and bonus icons that the game has. The first of these special symbols is the boom box symbol which acts wild like a joker card so it can replace any other icons with the exception of the scatter icon which is represented by none other than the high heels pink shoes. This scatter icon can reward players greatly in scattered rewards when players get a minimum of 3 scatter icons anywhere on the reels.